February 6, 2019 By Allyson 17 Comments This post may contain affiliate links. Read my disclosure policy. Valentine’s Day is a great time to show the people in your life that you care! Here are some great Valentine’s Day Ideas to make everyone feel special! With Valentine’s Day around the corner, I wanted to find some fun ideas of things to do. I originally published this article in 2013, so I have updated it with some fresh Valentine’s Day Ideas as well! 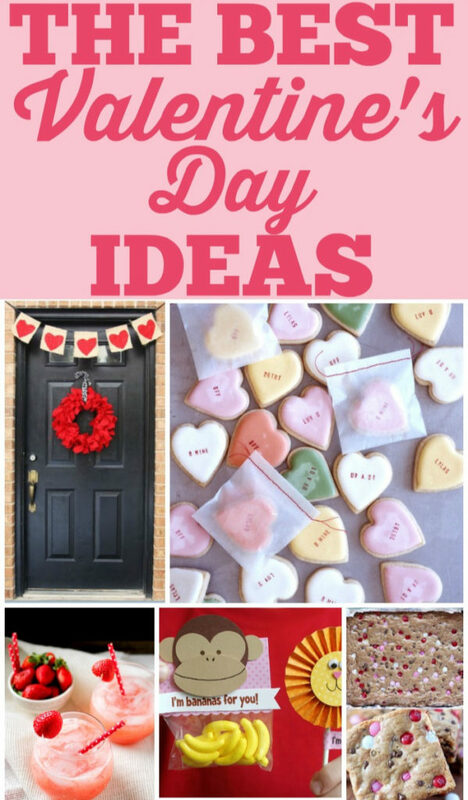 From Valentine’s Day cookies, to homemade cards and home decor, there is a little bit of everything. This super cute Valentine’s Day Wreath is so easy and gorgeous! I love this idea of taking simple twigs, and sprucing them up with some color. 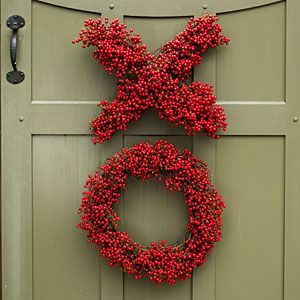 To make this wreath checkout the step by step video on Southern Living. 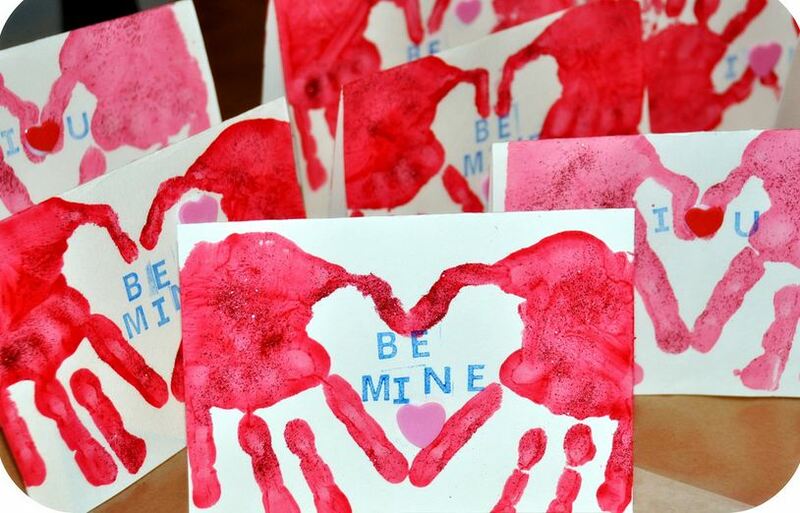 This next project is a really cute valentine’s day idea to do with kids. You need some paint or stamps to press little fingers into, some card stock and a sharpie, and you are good to go. Unfortunately I could only find this imagine, and not the source where it came from. 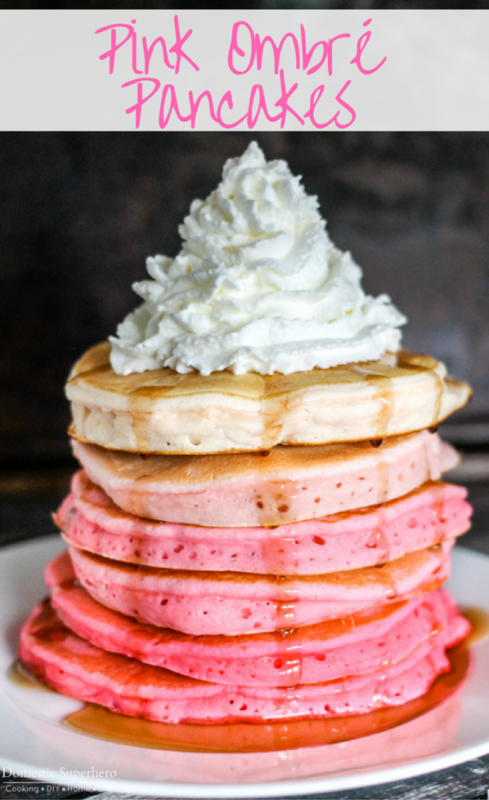 Pink Ombre Pancakes are the perfect breakfast to wake up to on Valentine’s Day morning! You can make these with pancake mix or homemade pancake mix, and then all you need is pink food coloring. I like gel food coloring because it’s so vibrant, but you can find the step by step instructions, as well as a how-to video here. 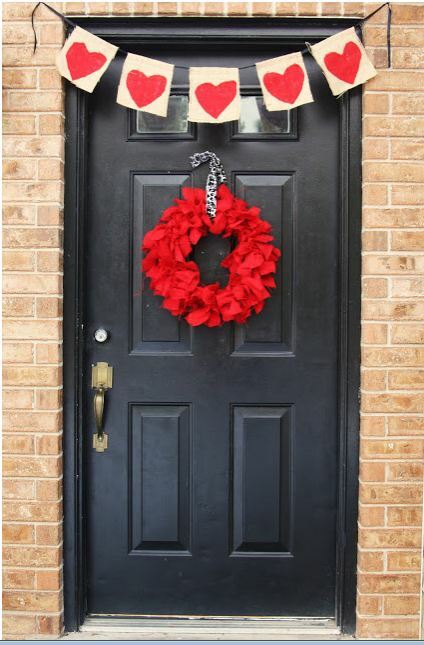 Next up is a great looking door that has been decorated for Valentine’s Day by A Little Crafting. I actually made a burlap wreath very similar to this one last Christmas, and it was really easy and cheap! I love the burlap banner too- what a great touch! This is a super easy DIY for Valentine’s day! 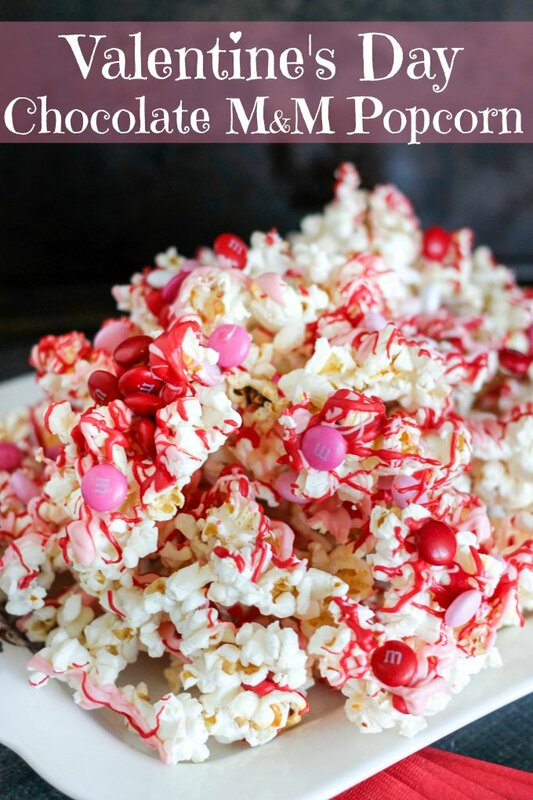 Valentine’s Day Chocolate M&M Popcorn is the PERFECT Valentine’s Day treat! It’s so delicious and totally easy to make! My kids LOVE making this Valentine’s Day Idea with me and they absolutely love it! You only need a few ingredients like candy melts, and you can find the holiday M&M’s at the store usually starting the beginning of February. 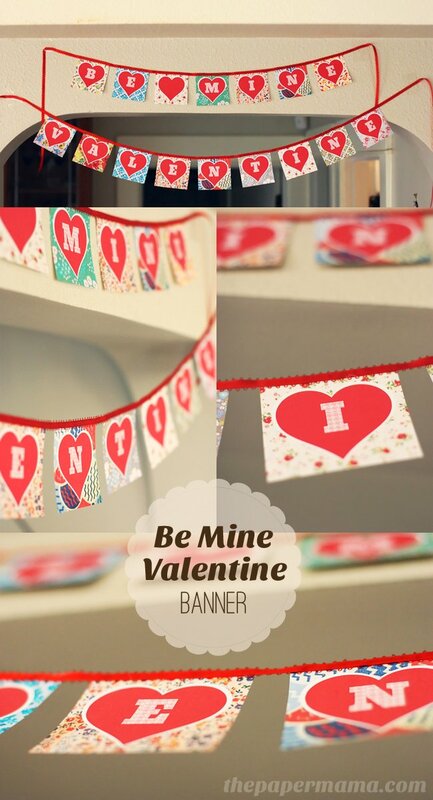 Looking for some easy Valentine’s Day decorations for the inside of your house? 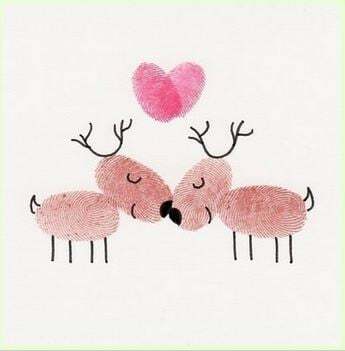 Take a look at this super cute banner from The Paper Mama. She is so generous that she is offering this banner as a free printable! Just load up some paper in that bad boy and print! Get some cute ribbon and hang this up! Whether you have kids or not, this next tutorial on how to make some homemade Valentines is so super cute! Fiskars is giving instructions to make 3 really awesome DIY valentines. 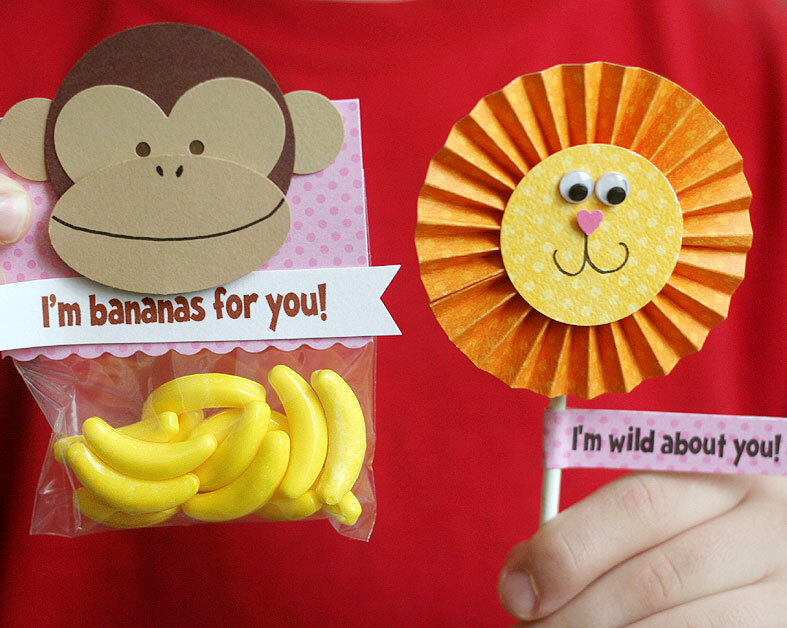 This is such a cite Valentine’s Day Idea; I love this little monkey! Hosting a party? These M&M Cookie bars are super easy to make and majorly delicious! I can’t wait to make these! Now, if you are hosting a party, I am sure you need some adult beverages. 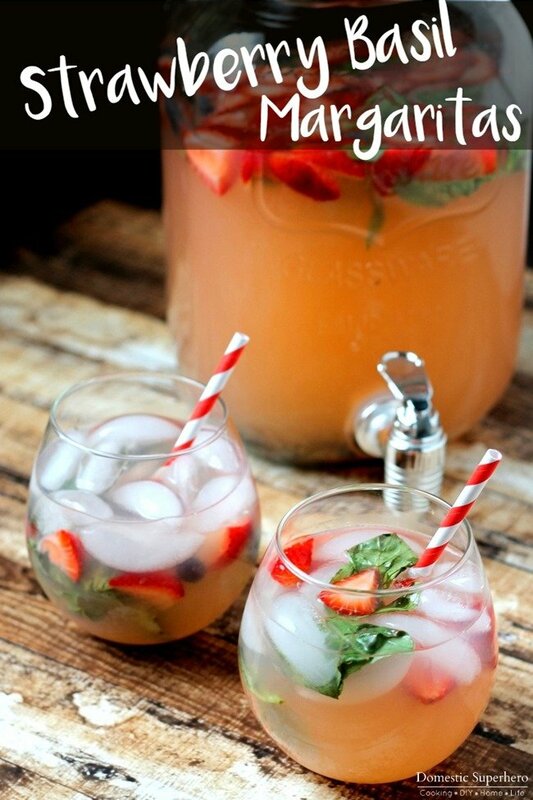 These Strawberry and Basil Margaritas are perfect for washing down cookies. By letting the Strawberries sit for a few hours in the drink, the margaritas turn a festive shade of pink! Perfect for a romantic cocktail, too! 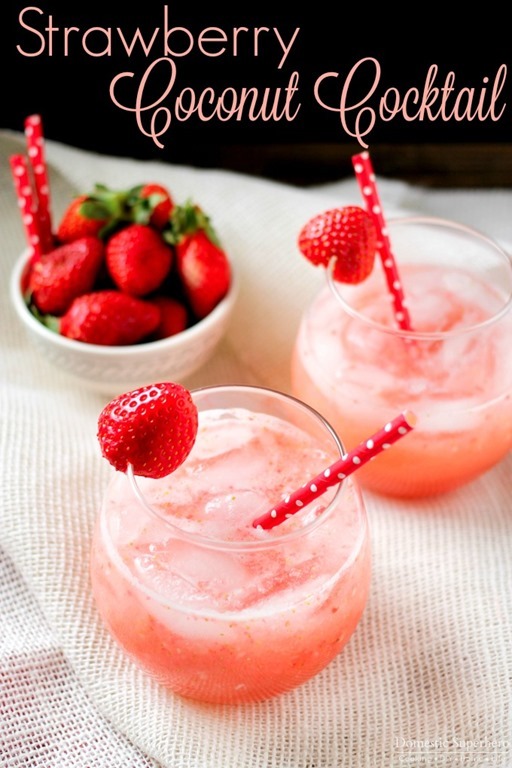 Another delicious cocktail is this pretty pink Strawberry Coconut Cocktail! It only takes a handful of ingredients and is so delicious! Moving on from food, these adorable DIY cards are adorable. If you follow my blog, you know that I just love doing any type of hand print art. It’s simple for kids to do, and they are so proud of themselves when it’s finished. It is also a great keepsake for parents as well. Rosy~Posy gives a great step by step tutorial on how to make these! For some free and awesome home decor, check out Plum Adorable. 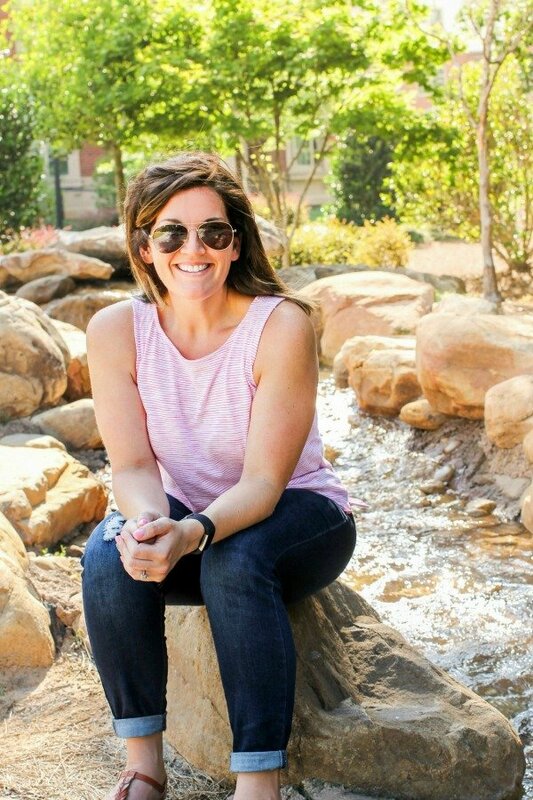 She has a ton of free printables and Valentine’s Day ideas! I love the subway art, and already have it displayed in my kitchen. Those xoxo blocks look super easy to make too. 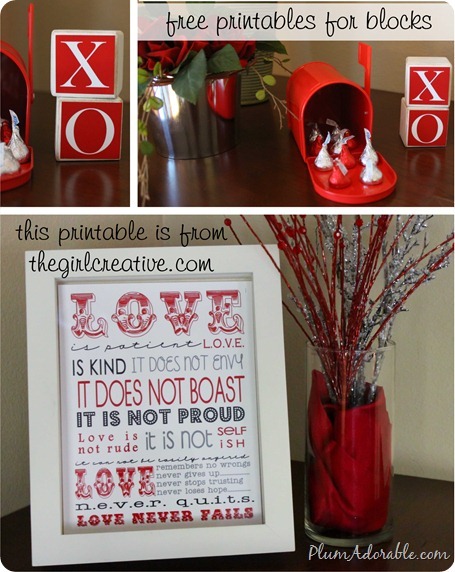 She has several other ideas and printables for Valentine’s Day as well. 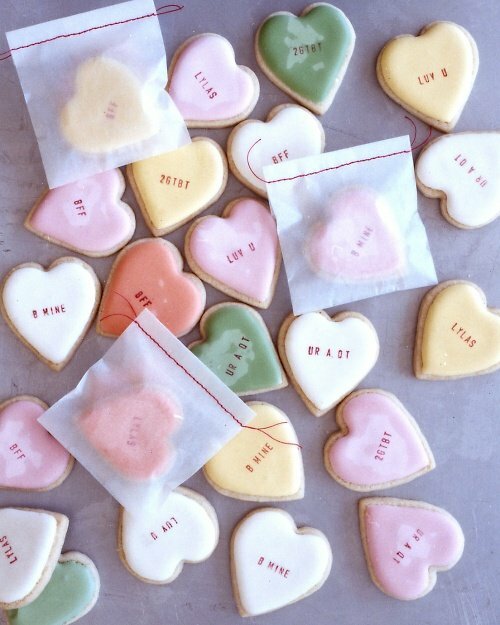 I love these Conversation Heart Cookies from Martha Stewart. These would make a great dessert or gift bag favor for those school parties. Lastly, if you just plan to stay in and snuggle up with your sweetie on Valentine’s Day, this Strawberry cake would make the perfect at-home dessert. A person who commented on this recipe said, “Really perfect for Valentine’s. This cake speaks of nothing but love. Okay, perhaps sweetness, and passion and beauty”….it must be great, right!? 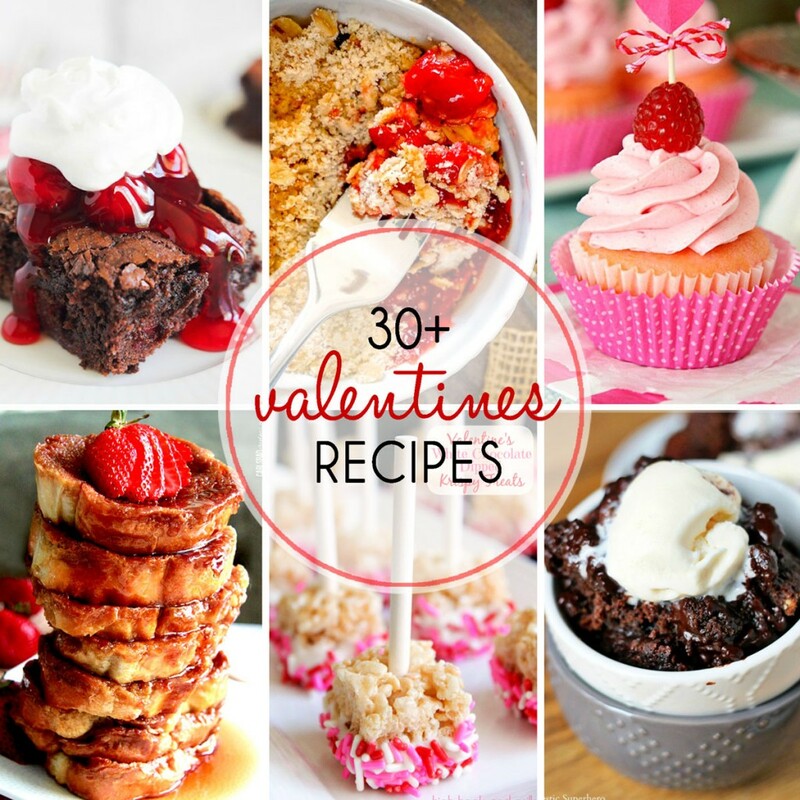 If you want more Valentine’s Day Ideas, especially food, you need to checkout these 30+ recipe ideas for Valentine’s Day! 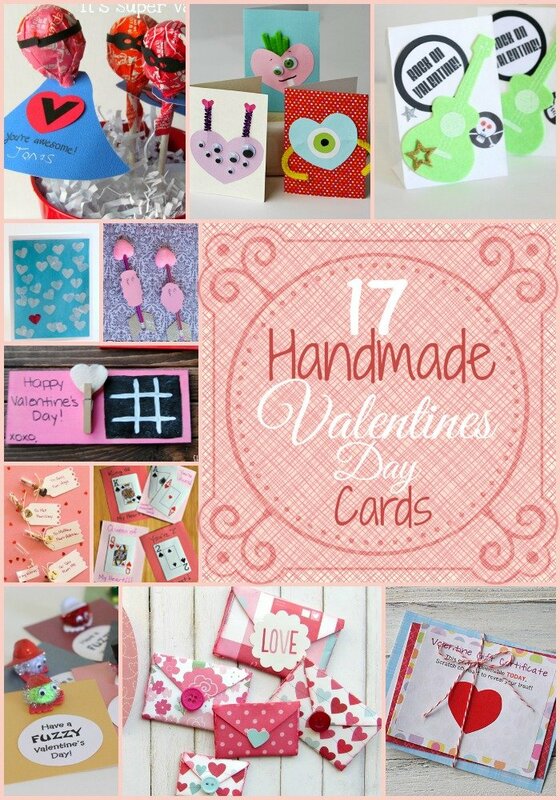 I also have a GREAT list of a ton of HANDMADE VALENTINE’S DAY CARDS! Check that out HERE! You always full of great ideas and already thinking a month in advance! nice! How the heck does the skyscanner ad at the bottom of this page know I’m planning a trip to Praque from Madrid. Though it says “Cheap flights from Prague to Madrid” so it’s almost right. a bit scary! LOL Lauren….it knows too much! These are cute ideas! I never cared about valentines day until I had my kid. Holidays are fun, now. Ha! I love the Valentines Day door decor! So fun! t gets you excited for vday, right?!? Thanks for stopping by! These all look so fantastic, perfect idea for Valentine’s! My favorite has to be the chocolate M&M popcorn! So many fun ideas! I’m going to make those pancakes for my daughter -she loves pink! Wow some great ideas. I will definitely use this post. Thank you for sharing this with us. I can not wait for Valentine’s day. 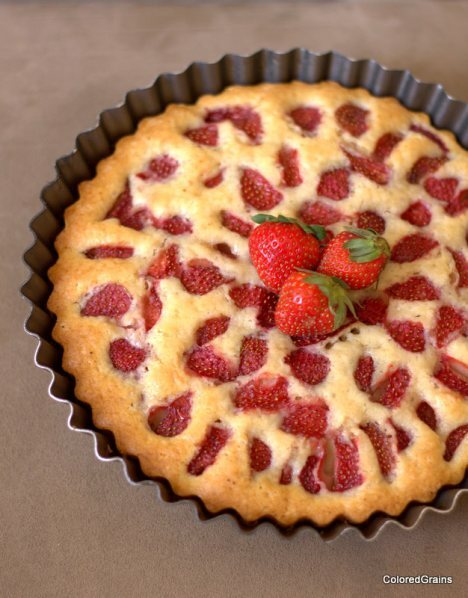 I want to try to make a strawberry cake. Looks very tasty! These are all great ideas! I think I will make Valentine’s M&M Cookie Bars. They look fantastic!